Last friday I attended the 2011 Open Minds exhibition at the National American History Museum. The exhibition featured inventive work from the best student teams across the nation. There were solar sanitation systems from the Georgia Institute of Technology, portable showers from the Art Center College of Design, a rickshaw bank from MIT and many more. Perhaps the most interesting project however, came from the University of Colorado Boulder: Fuel Briquettes. These briquettes are made from Jatropha plants native to Guatemala and can be used for every day cooking fuel needs. The briquette itself is environmentally friendly and "can be produced at low cost using manual technology and free raw materials." That was my favorite part about the project; it's main ingredient is something growing in yards all over Guatemala. It would be like taking grass from your front yard and converting it into cooking fuel. This technology is especially important because of the emissions that come from normal cooking fuel in under-developed nations. A recent blog post revealed that women and young girls, who do the cooking in Africa, face daily exposure to levels of pollution which are estimated to be the equivalent of consuming two packets of cigarettes a day. 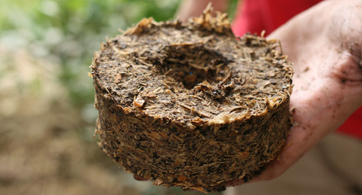 This fuel briquette is just the thing to help prevent respiratory diseases and other harmful pollutants from reaching the native people of these countries. With the briquette their fuel would not only be growing right in their villages, but it would be clean. To learn more about the University of Colorado Boulder's project, or watch their video submission for the 2011 Open Minds conference click here.